Last year, I picked up a book called "50 Ways To Make Google Love Your Website" when I was running an online wedding favor company and was in the midst of planning our website. The book didn't really cost a bomb but was jam-packed with advice on how to improve your website's visibility to Google search engine and remain my favorite book so far. I admit that I am not an expert in website programming much less a SEO expert but I highly recommend this book to anyone that is just starting out online. Read this book before you design your website and it will definitely make your site visible among the ten of thousands of other local online business competing for the same targeted audience as yours. These are just some SEO tips that I gleaned from this book. I am going to make it ultra simplified here, so, if you need further details, pick up the book yourself, you will be doing yourself a great favor. SEO Tip #1 : Plan your website's name in advance using "Google Adwords, Keywords Ideas"
This is the most important part especially for a new start up that has no brand recognition in the market, having the right website name is essential in driving traffic from natural search engine result. For example, if you are thinking of creating a website on Malaysia property market, naming your website as www.propertiesmalaysia.com.my is much better than www.PROPERTYAGENTABCcom.my unless you are a very famous property agent with reputation that supersedes you. 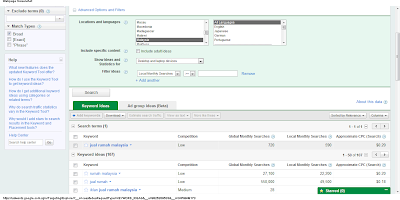 If you compare the famous Malaysian Property website www.iproperty.com.my which has a monthly local search of 60,500 against properties malaysia monthly local search of 14,800 at least it's not too bad especially for a start-up. 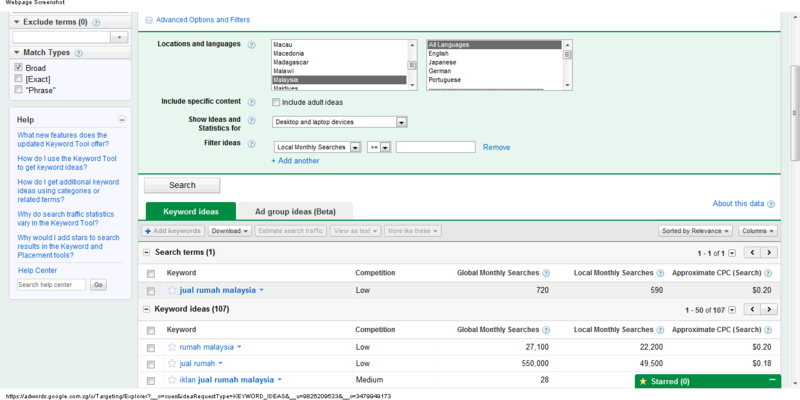 Now, you can also do variations with your local language say www.rumah-malaysia.com.my which has a local monthly search of 22,200 and compare it with your website's name local monthly search to see the stark difference. Meta Description is your chance of describing to the human searchers what they will find if they click on your website. Google don't really care about what appears in your meta description, it's just a temptation for the humans to click, what Google do care about is that click which equals to relevance to Google and that relevance will translate to higher natural google search ranking for your site. Do not tempt users with descriptions of things that they will not find in your website because if they click on your site and then close the browser all within a few seconds, this results in irrelevance to Google and Google will not display your site again the next time the same keyword is queried. For example look at www.iproperty.com.my search result again. The sentence "Malaysia Property For Sale and Rent" in blue is it's title while the sentence "Looking to Buy, Sell, or Rent Malaysia Property and Real Estate? Search Malaysia's No 1 Property Classifieds for Free Today!" in black is their meta description. Notice the clever use of terms relating to property such as Buy, Sell, Rent, Property and Real Estate? These are terms commonly used when searching for properties. SEO Tip # 4: Reference Your Images. Remember Google is essentially blind to images, so you have to describe their attributes to google and the most essential image attribute to Google is its alternate text description which in the example above is "mont kiara condo for sale"
SEO Tips # 5 : Create a site map for your site and submit it to Google, go here for more information. SEO Tips # 6 : List your business on Google Maps for free for better visibility. These are just the basics to get you started and the few that I use quite often whenever I write my blog posts. To really unlock the power of diy SEO, I would strongly suggest you pick up this book and make it your dearest companion. Get yours from Amazon today!